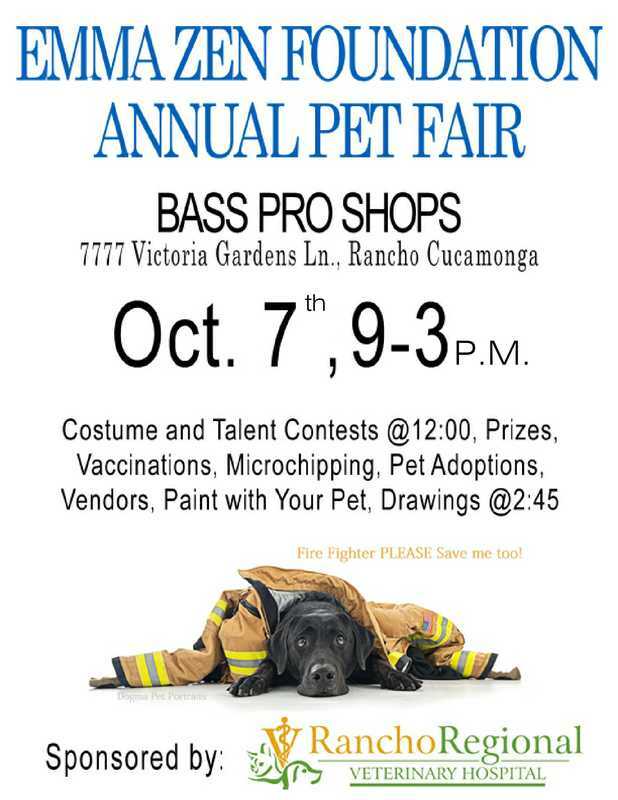 On October 7th, from 9 AM-3 PM, Bass Pro Shops invites the community to join Rancho Regional Veterinary Hospital, in in celebrating The Emma Zen Foundation’s 4th Annual Pet Health and Safety Fair. Lamar Advertisement San Bernardino and Riverside County has done quite a job to letting you the public no about the event. Did you see us on the freeway! If so, mention it at the Emma Zen Foundation's Booth for a FREE RAFFLE TICKET! All proceeds from the event will make it possible for fire departments to carry the Pet Oxygen Masks. The pet fair will include a pet costume and pet talent contest. We our hosting prizes from Dog Nose It, Furever Pawz Rescue, and Omlet's Fido Studio!!!! Vendors for you and your pet, Pet adoptions, Vaccinations, Micro-chipping and a free microchip check are all just part of the fair. The Pet Health and Safety Fair has booths for your pets and for the humans who love them! Come meet our Grand Marshall, Penelope, the puppy Saved by Firefighters in a Home Emergency this past year. Watch our namesake Emma Zen, arrive in a Sidecar! And hear the roar of the local Fire Truck as they pull in as well! Come join, Shop, Play, Adopt and Have some free weekend fun with furry friends! ​Have you seen the Fido Studio by Omlet? It is about as spectacular and functional as anything we have ever seen. Why let your pet's furniture over take your home, when you can incorporate it into your own enviroment! You can purchase raffle tickets at the event, or receive a free ticket with every vendor purchase!